A few days away from work culminated in the three days on Skokholm Island. 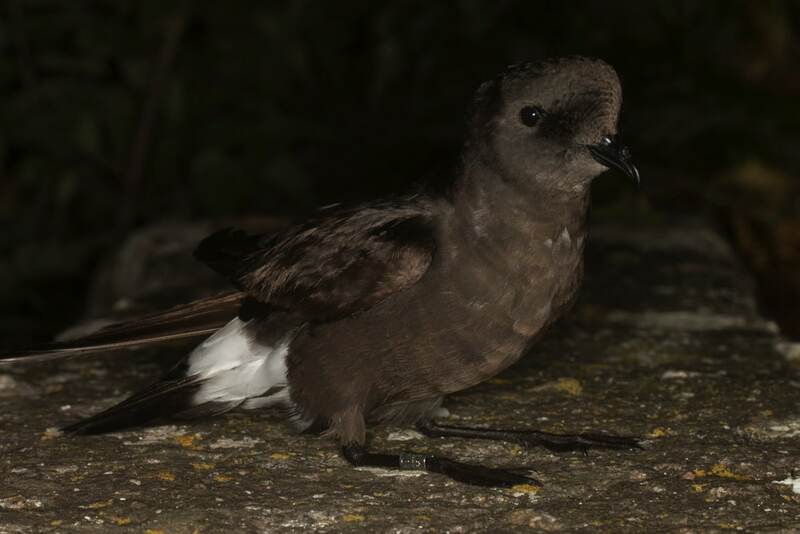 On the boat on the way over we discovered that some intensive ringing of European Storm Petrels was going to take place over the nights of our stay. We were looking forward to some relaxing time away from the phones and emails, but couldn’t resist the chance of handling this tiny sea bird. So it was a very late night working until 3 in the morning. But what a night it was. The wardens and the other qualified bird ringers were luring birds into the mist nets by playing a selection of the storm petrel calls, where they were being bagged up ready from processing – have their weight and key measurements taken, and fitted with a unique ring. 256 birds were trapped. 8 had been trapped on the island in previous years and three birds were from other sites – four from close on the mainland, one from Portland Bill in Dorset, England and one as yet unknown. We were fortunate to be able take some photographs from the release site. I was lucky enough to get this one full in the frame and most in focus – a stroke of luck since we were working in the small red glow from a head torch. If you want to know more about Skokholm Island then head over to the warden’s blog at http://skokholm.blogspot.co.uk/ .